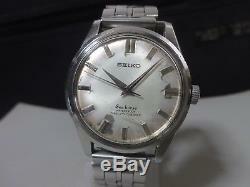 Japan SEIKO mechanical watch " Sea horse " in 1965. Movement: 66, SEIKO Suwa factory, Hand-winding, 17 jewels. I can not open the caseback, too tight, no picture of the movement. Dial: Original, signed JAPAN 66-8920T, many stains, discolored. Glass: Original, acrylic, some cracks. Band: Used, it fits for wrist of 17 cm or less. Condition: Used , it runs well, +- 1 minute a day. For practical, everyday use, it would be advisable to have the movement cleaned and oiled. It is described on page 19, 49 of the book Japan Domestic Watch Vol. The item "Vintage 1965 SEIKO mechanical watch Sea horse 66-8980 Rare watch" is in sale since Tuesday, November 13, 2018.